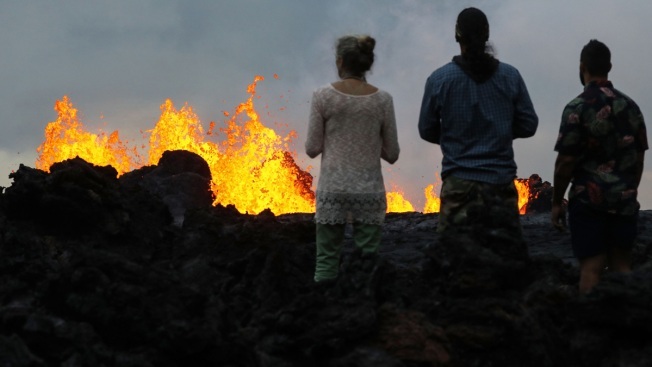 In this May 26, 2018, file photo, onlookers watch as lava from a Kilauea volcano fissure erupts in Leilani Estates, on Hawaii's Big Island in Pahoa, Hawaii. Kilauea volcano on Hawaii's Big Island has had it all over the past three weeks: molten rock shooting toward the sky, lava oozing from the ground and ash clouds rising miles into the air. You can also add "vog" to the mix. Scientists say higher sulfur dioxide emissions recorded at the volcano's vents in recent days are creating the potential for heavier than usual vog, or volcanic smog. So far, trade winds have been mostly blowing the gray haze offshore. The U.S. Geological Survey has been answering questions about vog and other scientific terms pertaining to the Kilauea volcano. Erm...we're going to have to say no, that's not safe. (Please don't try!) If the vent is emitting a lot of SO2 or H2S, they would taste BAD. And if you add sulfuric acid (in vog, for example) to sugar, you get a pretty spectacular reaction. Volcanic smog, or air pollution, is created by vapor, carbon dioxide and sulfur dioxide gas released from Kilauea. It reacts in the atmosphere with oxygen, sunlight, moisture and other gases and particles. In a matter of hours or days, it converts to fine particles that scatter sunlight, creating a haze that can be seen downwind of Kilauea, according to The Interagency Vog Dashboard, which is made up of Hawaii, U.S. and international agencies. The U.S. Geological Survey said sulfur dioxide emissions from the volcano have more than doubled since the current eruption began. Kilauea was belching 15,000 tons (13,607 metric tons) of the gas each day, up from 6,000 tons (5,443 metric tons) daily prior to the May 3 eruption. People living miles from the eruption are paying attention to the amount of noxious fumes pouring out of the volcano because it creates potential for more vog. WHAT ARE THE HEALTH IMPACTS? "Everyone is having symptoms now on some level," said Dr. Josh Green, a state senator and emergency room physician who has been volunteering in communities where lava fissures have opened in neighborhoods. Symptoms for generally healthy people can include burning eyes, headaches and sore throats. But those with asthma or other respiratory problems can end up hospitalized. Those who are healthy, physically active and don't smoke can usually tolerate basic symptoms, Green said, adding hospitals are seeing more patients with difficulty breathing. Green's mom, Natasha Green, who lives on the Kona side of the island, said the vog was particularly bad on Tuesday. "It makes it very hard to breathe," she said, adding that her other symptoms include coughing and watery and stinging eyes. She's had to use an inhaler, which she doesn't need when there isn't vog. She's a former smoker, "so that's probably part of the problem," she said. A man was seriously hurt when lava struck him in his home in Pahoa, Hawaii. Vog can affect areas far from the volcano, including the western side of the Big Island and even other islands. But lately, trade winds have been blowing most of the vog offshore. The National Weather Service said it expected trade winds to slow this weekend, creating hazardous air quality. With trade winds, communities where lava fissures have opened and those downwind are the most affected. Kilauea is erupting on Hawaii's largest island, so there are plenty of areas that aren't suffering from the effects of vog. "My phone's been ringing off the hook," said Steven Businger, chairman of the University of Hawaii's atmospheric sciences department. "A little old lady out of Minnesota wants to know if she should cancel her vacation — that kind of thing." He told her not to cancel because the vog was blowing away from her planned destination, the Big Island resort town of Waikoloa. Businger also runs the Vog Measurement and Prediction Project. The website provides current vog conditions for various sites around the Big Island. IS THE VOG WORSE NOW? With an increase in emissions, there's more vog, said Lisa Young, environmental health specialist for the state health department's Clean Air Branch. Bruce Corker, a Kona coffee farmer, has noticed. When he looks down from his farm at Kailua Bay, it's hard to make out the water because it's the same gray color as the sky. "For me, it's just visual," he said. "I don't feel any effects on my lungs. I don't smell anything." Corker, who grew up in Southern California, compares vog to "Los Angeles-like smog." Retired photojournalist Chris Stewart says there's one good thing about vog: It intensifies the colors of a sunset. But it depends on how thick the haze is. "Some days it's thin enough you can see the sun passing through," he said. "But other days we just go inside because we can't see it at all." 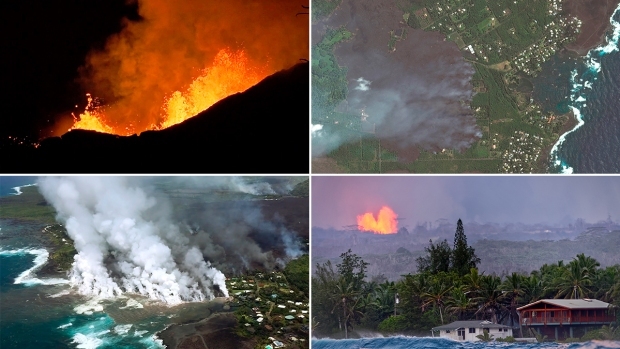 Stewart said he's grateful to be living on the Big island's west side — away from the volcano. "I almost feel guilty enjoying our sunsets," he said. Associated Press journalists Audrey McAvoy and Sophia Yan contributed to this report.